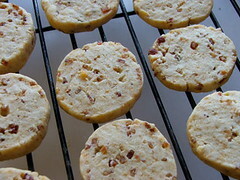 Yes, Cheddar Bacon Cookies. 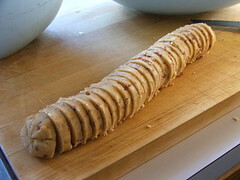 Now, before you ask, no this is not a sweet cookie. 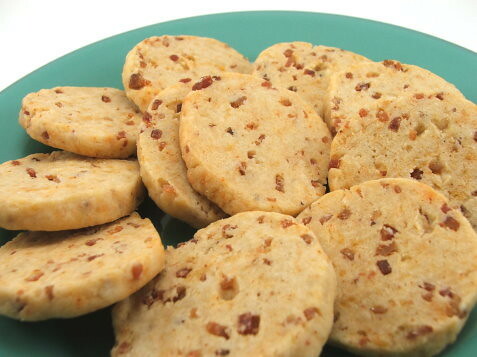 It is a savoury cookie perfect for appetizers for serving with a salad or soup. They are so good! These cookies are addictive. 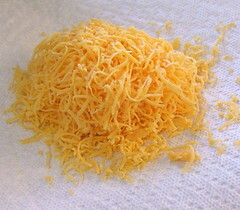 They are the perfect base for savoury spreads and toppings, but are just as delightful all on their own. 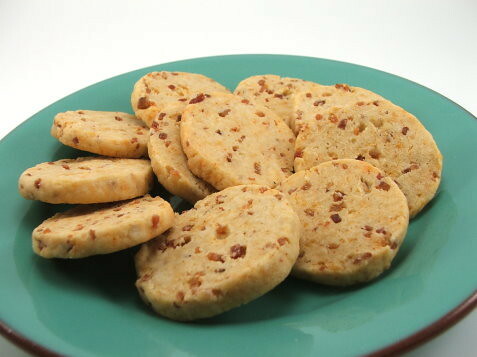 What makes them so lovely is the tangy cheese combined with the salty nuggets of smoked bacon all mixed into a tender cookie. 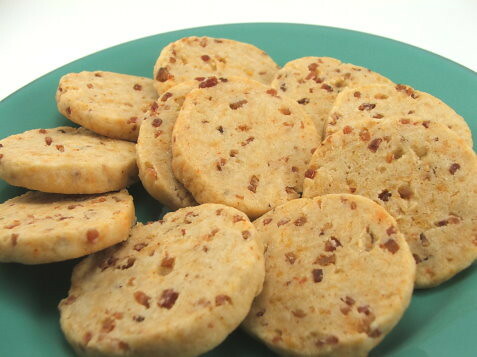 At once delicate and hearty, these cookies are always popular. 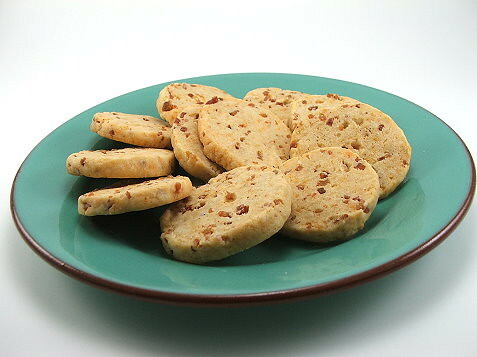 You can make the dough for these cookies a day in advance, wrapped in plastic in the fridge and when you are ready to serve them you simply slice and bake. 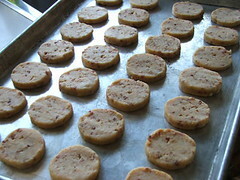 They are lovely warm from the oven, but are also good at room temperature and keep well in an air tight container for two days. 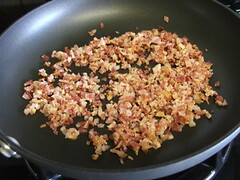 In a large skillet over medium high heat cook the chopped bacon until very crisp. 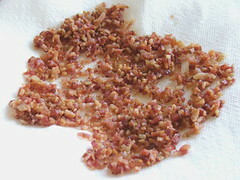 Drain on paper towel. 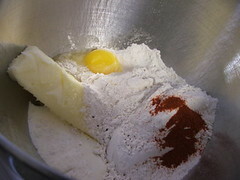 In the bowl of a stand mixer combine the flour, cayenne pepper, butter, egg, egg yolk, and cream. Mix until well combined. 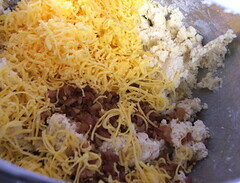 Add the shredded cheese and crisp bacon to the work bowl and mix on low speed until combined. 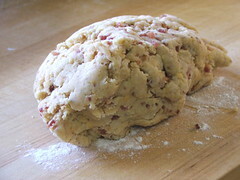 Turn the dough out on to a lightly floured board and roll into a log about 1 1/2″ around. 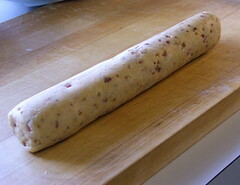 Wrap the log in plastic wrap and chill for at least two hours. 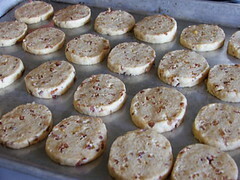 During the last half hour of chilling heat your oven to 350 F.
Once chilled slice into 1/4″ thick disks and place about 1/2″ apart on an un-greased cookie sheet. 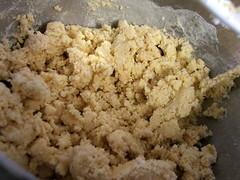 Bake for 18 to 25 minutes, or until the cookies are just turning golden abound the edges and the cookies are firm to the touch. Cool on a rack until they are slightly warm.